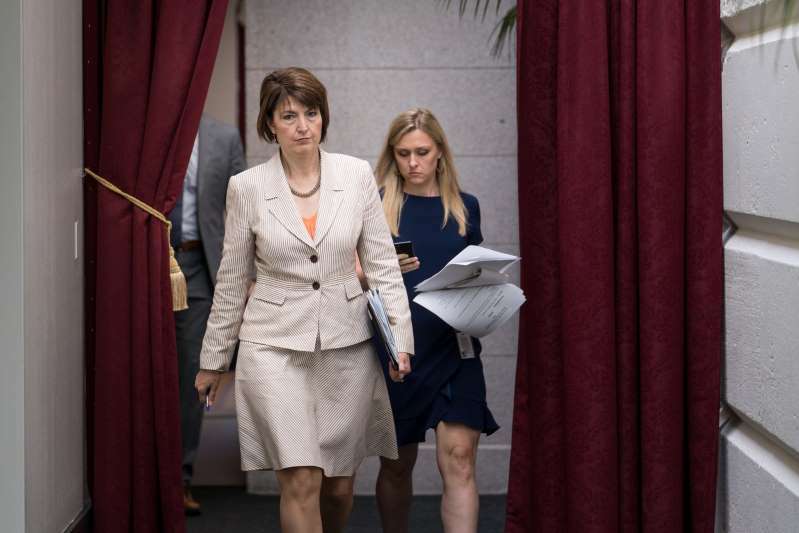 Cathy McMorris Rodgers walks to a closed meeting of House Republicans on Capitol Hill in Washington, DC on June 20, 2018. It was titanic when the Speaker of the House, the Democrat Tom Foley, lost his seat in Eastern Washington State in 1994, a takedown that heralded a long winter for his party outside of coastal and urban enclaves. So if an epic upset happens again in that same district, as seems possible after Tuesday’s primary, it will be because of party-flipping voters who haven’t given Democrats a sniff in a generation’s time. History is lurking again in the West. I caught up with the potential giant-killer in Washington’s Fifth Congressional District, the Democrat Lisa Brown, just after the shame of Helsinki, when President Trump sided with the tyrant Vladimir Putin over his own country. While others were talking treason, Brown was sticking to basics in meetings with farmers and small-town residents. That’s the point Democrats in the other Washington should not miss as they look at a map that has upward of 60 House seats in play. Yes, a majority of Americans find Trump repulsive — his lies, his pathological narcissism, his lack of decency, his illiteracy of democratic principles. But more important, his policies are not popular. Democrats don’t need to remind voters of the monster in the White House. Trump will do that himself, with daily tweets and his hate-filled rallies. Nor do they need to send out trendy socialists from New York to districts where the main ideology is common sense. The case in point here is health care. The district is red. Trump carried it by 13 points. Representative Cathy McMorris Rodgers, the highest-ranking woman in Republican House leadership, has held this seat for 14 years. And in those 14 years, she has consistently voted for things that hurt people in her district. Specifically, she long tried to take away health care, backing proposals that would have left 70,000 people without insurance in her swath of Eastern Washington. That area, unlike the Seattle metro area 300 miles to the west, has a disproportionate amount of poor whites whose lives were aided immensely by Obamacare. The big Republican tax cut, favoring the rich, means nothing in place where family incomes are low. Trump’s tariffs are killing farmers in a region where 93 percent of the wheat is sold overseas. Farmers fear those markets, lost in the incoherency of Trump’s trade tantrums, may never come back, as buyers find other countries with saner leaders. But it was taking away something so fundamental to life as health insurance that prompted Brown to get into this race. It seemed like a lost cause; McMorris Rodgers has never received less than 56 percent of the vote in seven general elections. But on Tuesday’s primary — basically an open poll, with the top two finishers going to the runoff, no matter the party — Brown held the incumbent to a near dead heat, both getting just below 50 percent of the vote. She may still top her with late returns. McMorris Rodgers is the woman that Republicans trot out when they want to put a female face on policies that hurt women. A mother of three, outwardly pious, who has drawn a government paycheck for most of her adult life, she seems harmless and friendly. But rather than be a check on Trump, which most voters want, she is one of his highest-profile enablers. She votes with Trump nearly 98 percent of the time. Of course she said Trump’s boasting of committing sexual assault in the Access Hollywood tape was not “appropriate,” but that hasn’t kept her from being a Trump apologist. This week an audio tape emerged of Representative Devin Nunes, chairman of the House Intelligence Committee, at a fund-raiser for McMorris Rodgers in Spokane last month. Throwing out any pretense of oversight, he told donors that Republicans in the House need to protect Trump from the special counsel. In this case, what happens in Spokane may stay in Spokane and hurt McMorris Rodgers. The culture of corruption around this president — his sleazy campaign manager on trial, three former Cabinet secretaries forced to resign in disgrace, all the grifting — have left many people saying, enough. Lisa Brown took a stand for working mothers back in 1993, when she brought her infant son to the floor of the Washington State Legislature for a late-night vote. She was told to remove the child. She protested; her day care was closed, and she had no choice. She went on to become the first female majority leader of the State Senate. After that, she served as a chancellor of Washington State University in Spokane. A seasoned pol, she will need to call on all her political muscle memory to win this race. For a quarter-century, Republicans have been winning in places like Spokane because of culture and resentment. The old way to scare people was through the three Gs — gays, guns and God. Of late, they’ve whipped up resentment against “elites.” This year, those words may have no more power than a summer wind.